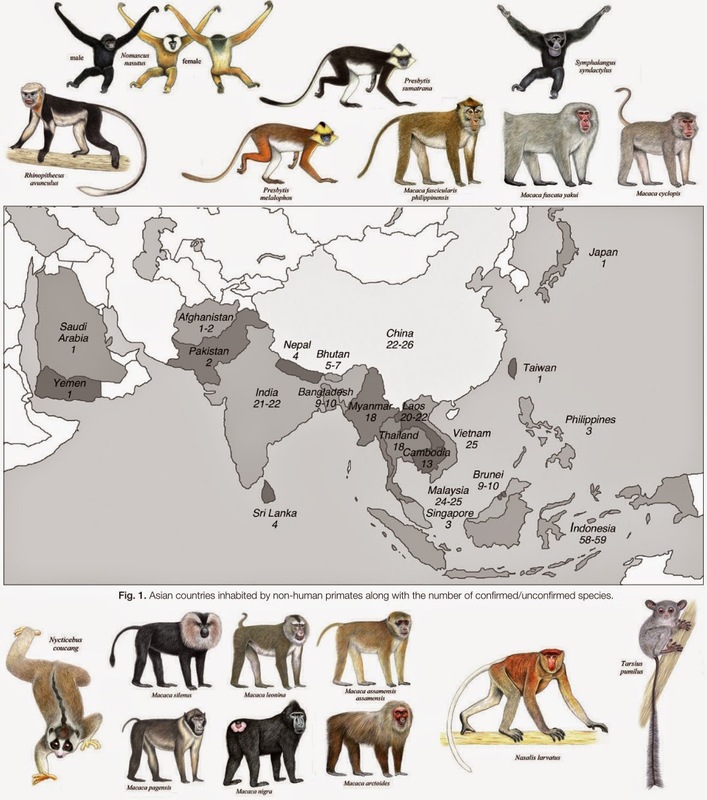 The present paper summarises and updates information on the taxonomy and status of Asian non-human primates from a new multi-author synthesis. For each species we include taxonomic authority, species type locality, subspecies, current distribution and conservation status. 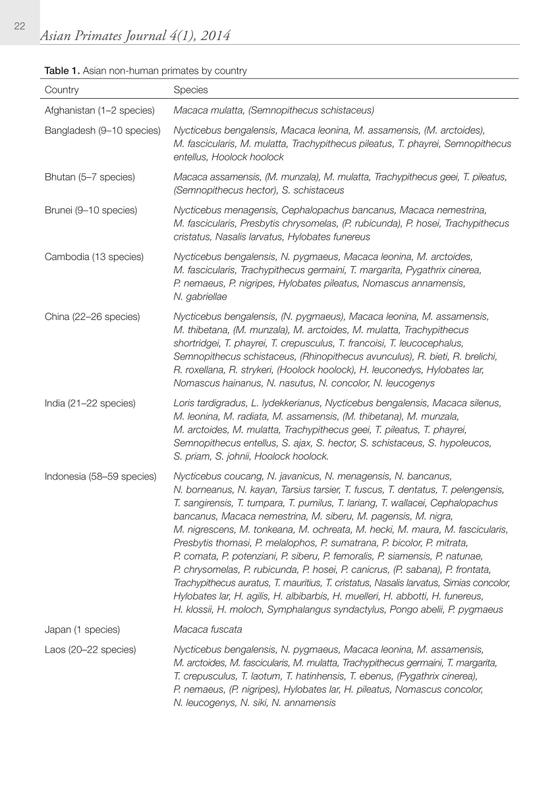 Including taxa described since the synthesis was published, the Asian non-human primate fauna comprises 119 species and 183 taxa, in 22 Asian countries. We give a breakdown of species by country, by conservation status category, and the number of species per status category in each family and genus. Of the 113 Asian primate species that have been assessed, 17 (15%) are Critically Endangered, 45 (40%) are Endangered and 25 (22%) are Vulnerable. The most endangered genera are Rhinopithecus, Pygathrix, Nasalis, Simias, Hylobates, Nomascus, Symphalangus and Pongo. Christian Roos, Ramesh Boonratana, Jatna Supriatna, John R Fellowes, Colin P. Groves, Stephen D. Nash, Anthony B. Rylands and Russell A. Mittermeier. 2014. 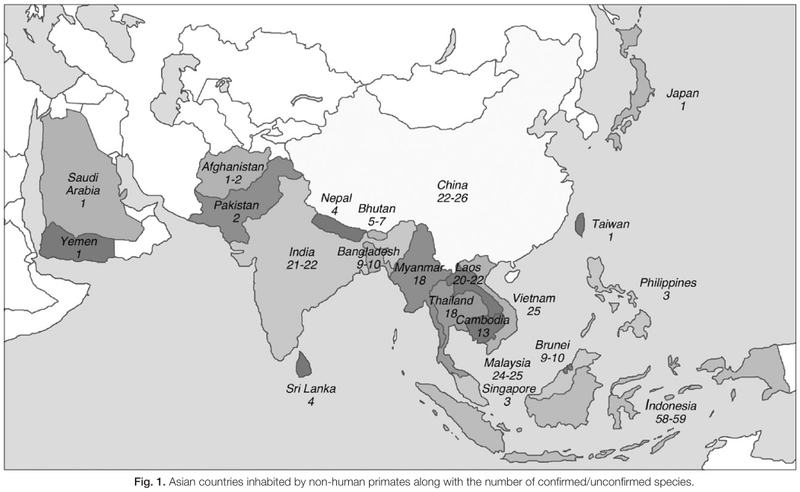 An Updated Taxonomy and Conservation Status Review of Asian Primates. 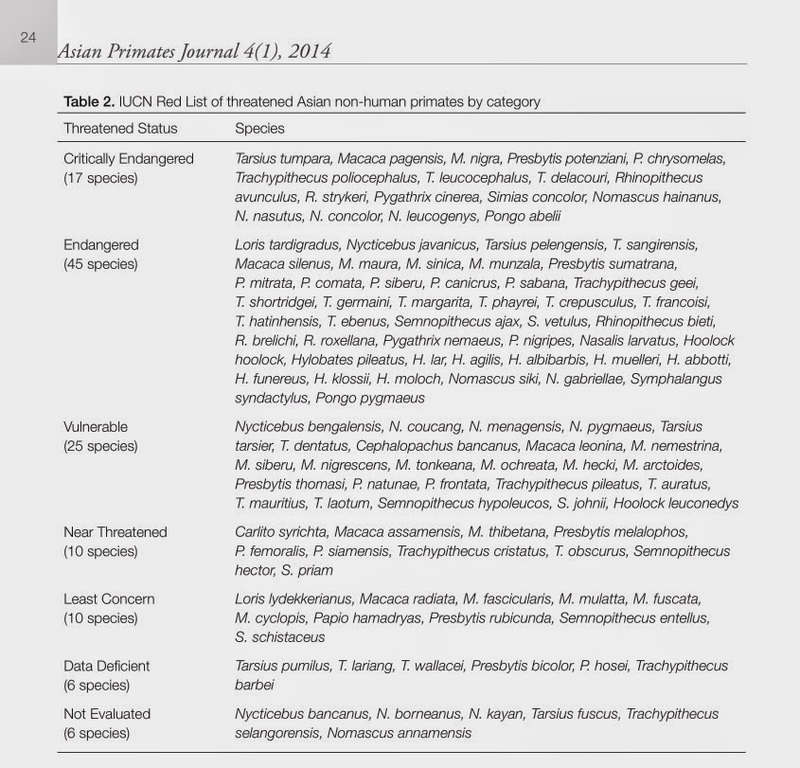 Asian Primates Journal. 4(1): 2-38. 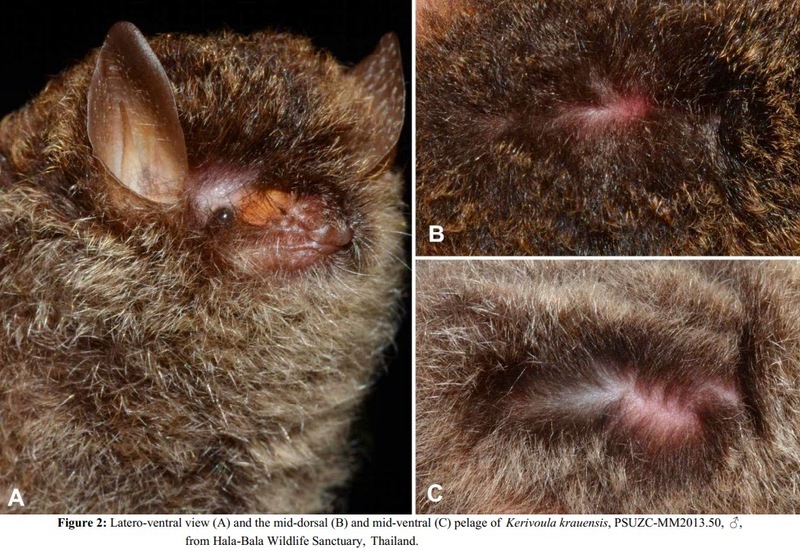 Figure 2: Latero-ventral view (A) and the mid-dorsal (B) and mid-ventral (C) pelage of Kerivoula krauensis, PSUZC-MM2013.50, ♂, from Hala-Bala Wildlife Sanctuary, Thailand. Figure 1: Distribution map of K. krauensis. Black circle represents new locality in Thailand and black star is the type and only known locality from Malaysia. In August 2013, an adult male Kerivoula krauensis was captured in a harp trap set in forest understorey in Bala Forest, Hala-Bala Wildlife Sanctuary, Narathiwat Province, Thailand. This is only the second locality record for the species, the first outside Malaysia and represents a range extension of 254 km, northwards from Krau Wildlife Reserve, Malaysia. 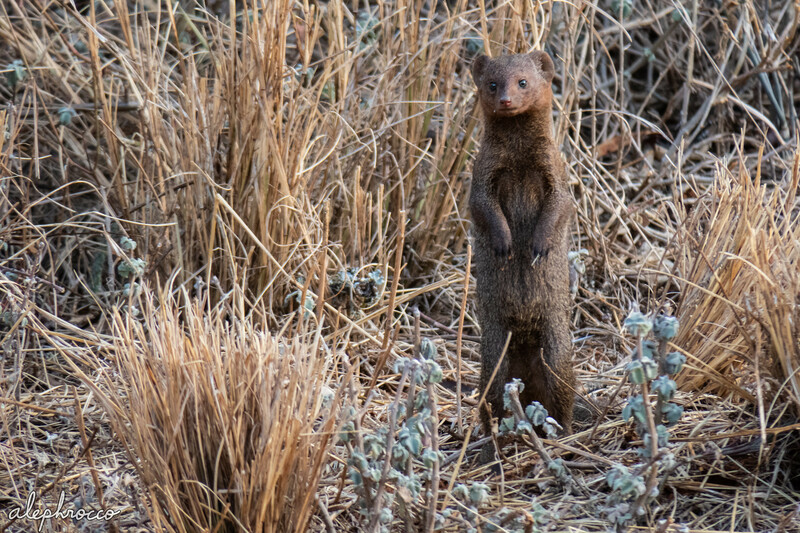 This discovery has important conservation implications suggesting that the species is more widespread than previously thought but also confirms previous findings that it appears to live in very low population densities as compared to other Kerivoula found in the same habitat. Information on its taxonomy, echolocation call, distribution and ecology is included. In addition, the new material from Thailand is briefly compared to other known species from the country. 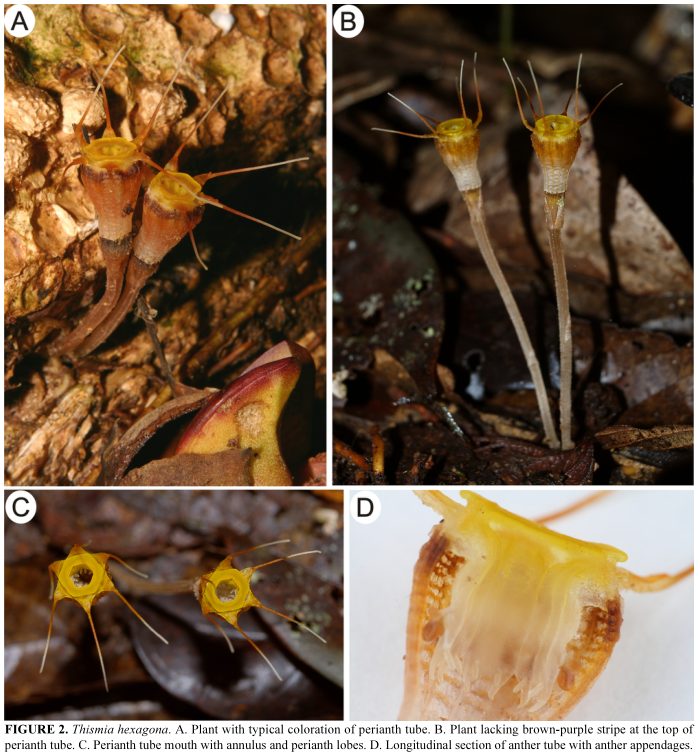 A new species of Thismia (Thismiaceae) from Borneo is described. Thismia hexagona was discovered in 2013 in lowland mixed dipterocarp forest in Ulu Temburong, Brunei Darussalam. The species is circumscribed, illustrated and its position within the Malesian species of the genus is characterised by insertion into the existing determination key. Its most conspicuous feature is bright yellow, sharply hexagonal flower annulus. Thismia Griffith (1844: 221) usually grows among leaf litter in shady wet forests and comprises 47 small mycoheterotrophic species (Chiang & Hsieh 2011, Mancinelli et al. 2012). Individual plants live underground through most of the year, only emerging briefly to flower and fruit after periods of heavy rain (Ho et al. 2009). Although several species have been described in temperate regions, Thismia occurs mainly in tropical portions of America and Asia. FIGURE 1. Morphology of Thismia gongshanensis. A. Habit. B. Magnified flower. C. Dissected flower, showing stamens, style and stigmas. D. Flower from holotype. 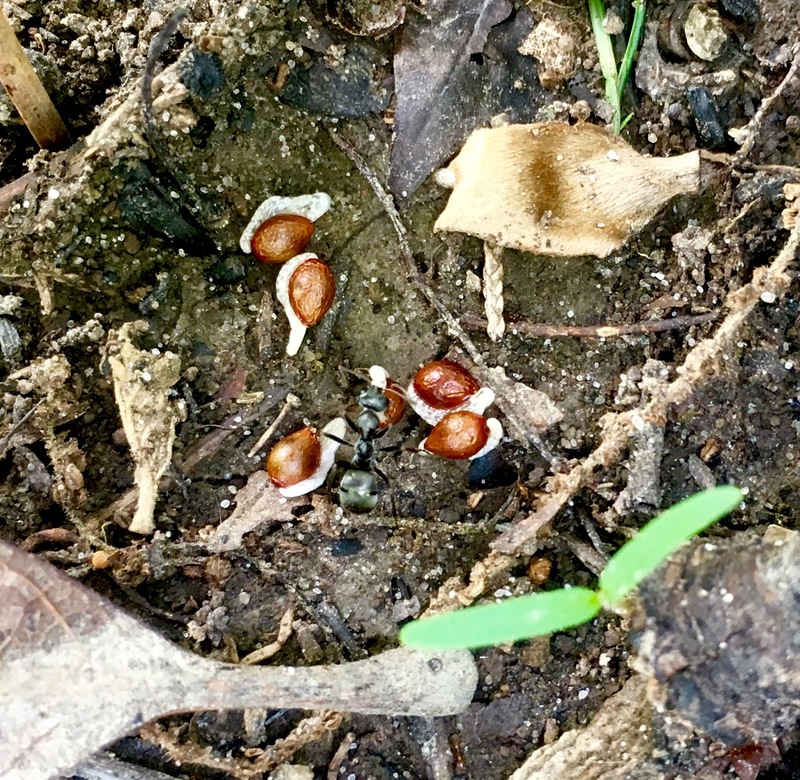 Ecology:—This species grows among leaf litter in shady wet bamboo forest. The dominant species is Chimonobambusa Makino (Poaceae). Other accompanying species include: members of genera Aeschynanthus Jack (Gesneriaceae), Agapetes D.Don ex G.Don (Ericaceae), Amomum Roxb (Zingiberaceae), Balanophora J.R.Forst. & G.Forst. (Balanophoraceae), Beccarinda Kuntze (Gesneriaceae), Curculigo Gaertn. (Hypoxidaceae), Monotropa L. (Ericaceae) and Myrmechis (Lindl.) Blume (Orchidaceae). The mitriform perianth suggests myophily (Stone 1980), and a small dipteran species was found visiting T. gongshanensis at the time of collection. HONG-QING LI and YU-KE BI. 2013. 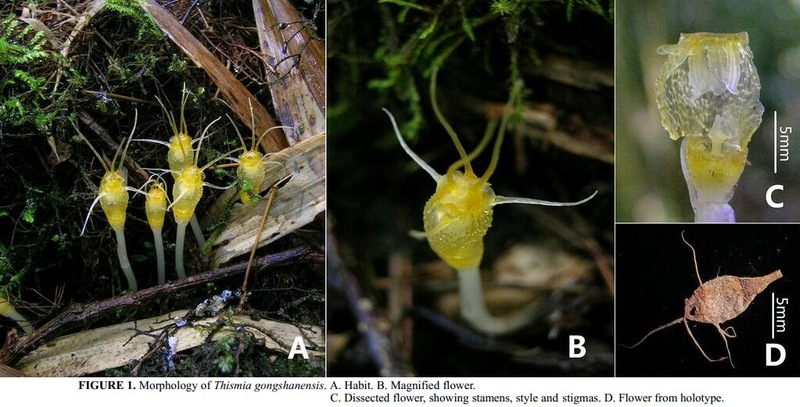 A New Species of Thismia (Thismiaceae) from Yunnan, China. Phytotaxa. 105 (1): 25–28. 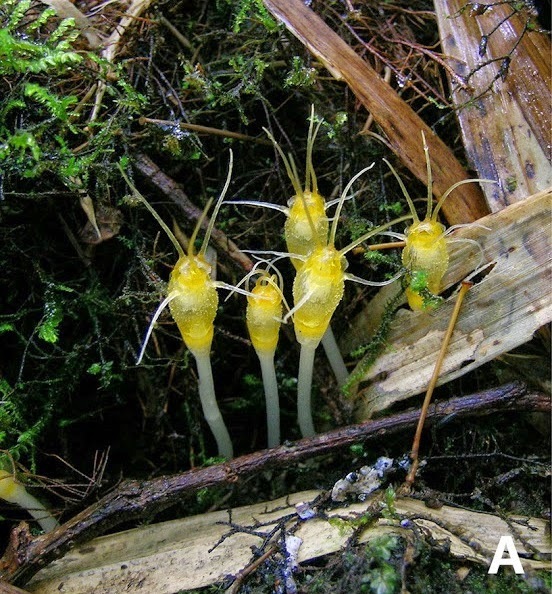 A new species of Thismiaceae, Thismia betung-kerihunensis Tsukaya et H. Okada, found during a botanical survey of Betung-Kerihun National Park, West Kalimantan, Borneo, Indonesia, is described and illustrated. This species closely resembles Thismia clavigera (Becc.) 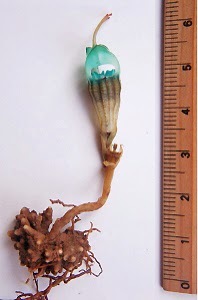 F. Muell, which is distributed in Borneo, Sumatra, Langkawi, and Thailand; however, it differs in flower shape, size, and color, having conspicuous hood-like appendages at the tip of the brilliant blue-green colored mitre formed by the three inner tepals. Moreover, it differs in the shape of the anther connectives that lack acutely elongated apices and has rectangular glands. The smaller stature of the species also distinguishes it from T. clavigera. Hirokazu Tsukaya and Hiroshi Okada. 2012. A New Species of Thismia (Thismiaceae) from West Kalimantan, Borneo. Systematic Botany. 37(1): 53-57. 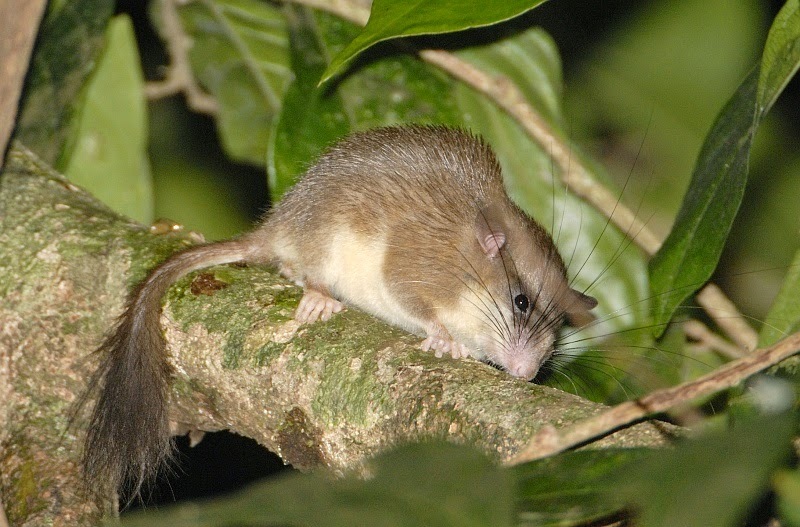 Spiny Tree Mouse Platacanthomys lasiurus is a rarely known endemic rodent, one of the two representatives of the rodent family Placanthomyidae. It inhabits the tropical forests of the Western Ghats of South India. A field survey was conducted from February 2002 to June 2005 in the Western Ghats to determine the status and distribution of this species. Intensive surveys were conducted in the Peppara Wildlife Sanctuary and the population status was assessed in 17 protected areas and 25 forest divisions using live trapping, questionnaire survey, direct observation and spot lighting. This species was recorded from 10 protected areas and 21 forest ranges, and except for the Peppara Wildlife Sanctuary all reports from other sanctuaries, namely the Neyyar, Thattekkad, Idukki, Chinnar, Eravikulam, Chimmony, Parambikulam and Aralam Wildlife Sanctuaries and Periyar Tiger Reserve, were new. This species occur in extremely low densities, and apart from the tropical evergreen forests it was also recorded in the riverine patches in the tropical moist deciduous forests. The status of this species should be elevated from the Least Concern (IUCN) category to the next category, i.e., Near Threatened. Jayson, E. A.; Jayahari, K. M. 2009. Distribution of Spiny Tree Mouse (Platacanthomys lasiurus Blyth, 1859) in the Western Ghats of Kerala, India. Mammalia. 73 (4): 331–337. Divya Mudappa, Ajith Kumar and Ravi Chellam. 2001. 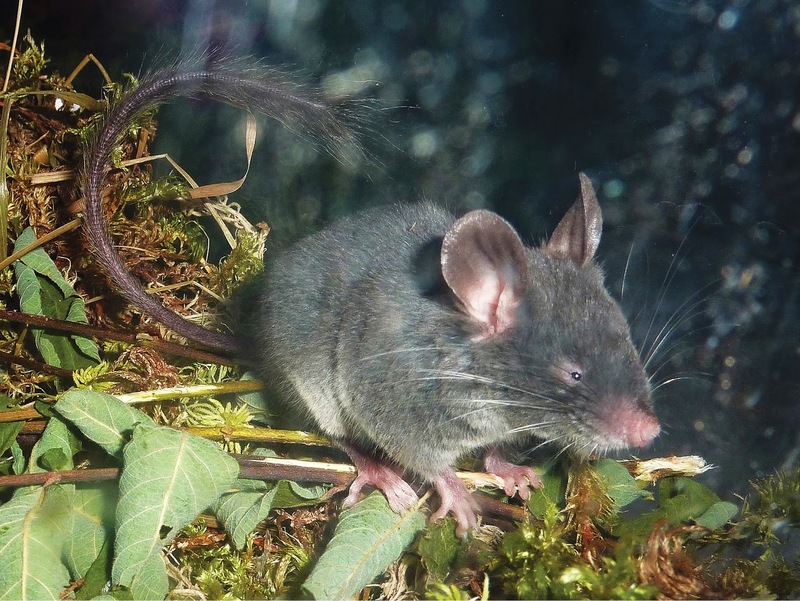 Abundance and habitat selection of the Malabar spiny dormouse in the rainforests of the southern Western Ghats, India. Figure 4. Typhlomys cinereus. Adult female from Sa Pa, Lao Cai Province, northern Vietnam. Background: The taxonomic position of enigmatic pygmy dormouse Typhlomys (Rodentia: Platacanthomyidae) from Vietnam is reconsidered based on both morphology and sequence data. Results: The analysis of mitochondrial and nuclear genes has shown that the pygmy dormouse from Lao Cai Province of northern Vietnam belongs to a distinct phylogenetic lineage of Typhlomys. The DNA analysis has demonstrated a strong genetic difference (0.245 to 0.252 for the cytochrome oxidase gene (COI), 0.079 to 0.082 for interphotoreceptor retinoid-binding protein gene (IRBP), and 0.028 for the growth hormone receptor gene (GHR) between this lineage and the sample from South China. Multivariate analysis of cranial and dental data, as well as of some external characters, has also separated the Vietnamese population from the pygmy dormouse from Fujian in southern China, the type locality of Typhlomys cinereus (Bull Soc Philomath Paris 12:8–10, 1877). Conclusions: Both genetic and morphological data confirm that there is a second species, Typhlomys chapensis (Field Mus Nat Hist Zool Ser 18:193–339, 1932), in the heretofore monotypic genus Typhlomys. We describe three new species of Pseudocalotes from the Bukit Barisan Range of southern Sumatra, Indonesia. 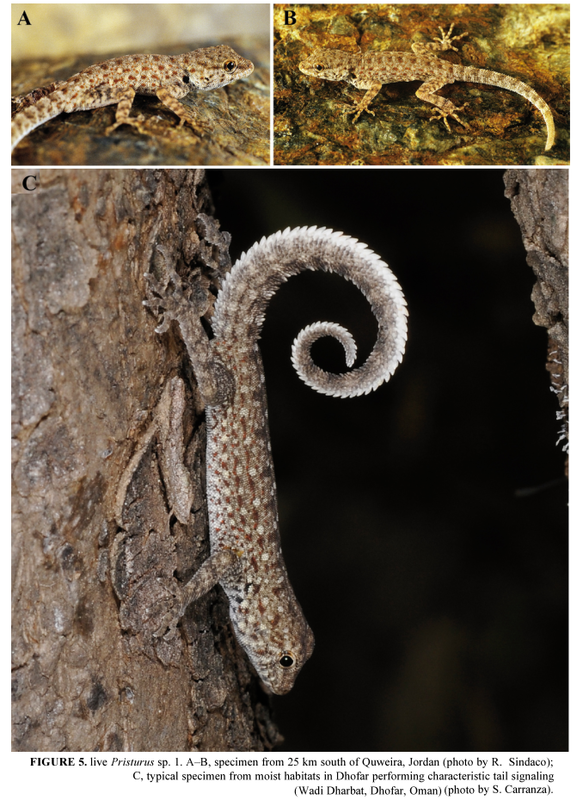 Pseudocalotes cybelidermus, P. guttalineatus, and P. rhammanotus differ from most congeners in having serrate dorsal crests that extend to the base of the tail and a dorsolateral series of enlarged heavily keeled scales. In these new species, subdigital lamellae of Toe III have prominent preaxial keels and lack or have greatly reduced postaxial keels. In contrast, P. rhammanotus resembles P. tympanistriga by having bicarinate subdigital lamellae at the base of Toe III. Like most congeners, these new species appear to be restricted to humid forests above 1000 m. We report several new morphological characters for Pseudocalotes and discuss their diagnostic value. Future systematic studies of this genus should assess presence/absence of interparietals, four different kinds of modified scales on the neck, a dorsolateral series of heavily keeled scales, and unicarinate lamellae under the distal phalanges of most fingers and toes. Our comparisons among congeners demonstrate the diagnostic value of width of the gap between the nuchal and dorsal crests and frequency data for contact between the nasal and supralabials and between the postmentals and infralabials. Finally, we discuss variation in morphology of subdigital lamellae at the base of Toe III and describe new conditions intermediate between the serrate fringe of most Indochinese species and the bicarinate lamellae of the P. tympanistriga. 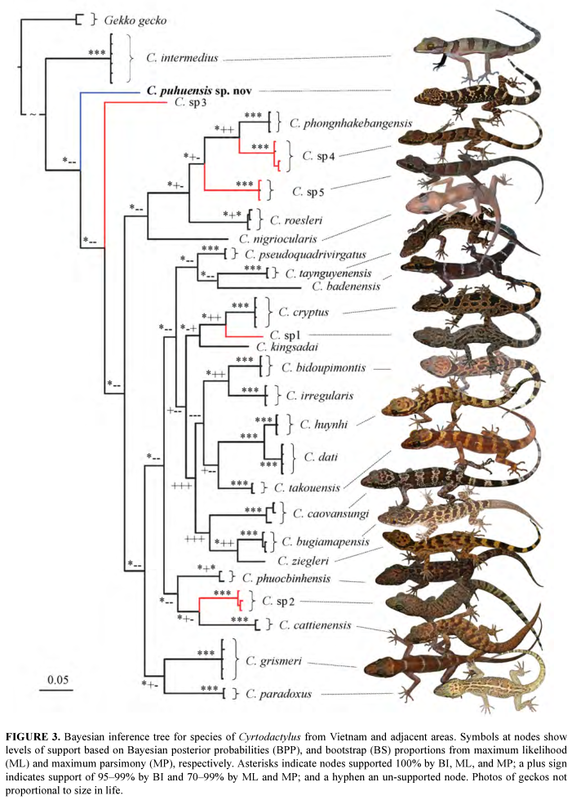 A molecular phylogeny of the sphaerodactylid geckos of the genus Pristurus is inferred based on an alignment of 1845 base pairs (bp) of concatenated mitochondrial (12S) and nuclear (acm4, cmos, rag1 and rag2) genes for 80 individuals, representing 18 of the 23–26 species, and the three subspecies of P. rupestris. The results indicate that P. rupestris is polyphyletic and includes two highly divergent clades: the eastern clade, found in coastal Iran and throughout the Hajar Mountain range in northern Oman and eastern UAE; and the western clade, distributed from central coastal Oman, through Yemen, Saudi Arabia and north to southern Jordan. Inferred haplotype networks for the four nuclear genes show that the eastern and western clades of “P. rupestris” are highly differentiated and do not share any alleles. Moreover, although the two clades are differentiated by a morphological multivariate analysis, no one character or set of characters was found to be diagnostic. Based on the molecular analysis of specimens from the type locality of P. rupestris rupestris, the name P. rupestris is applied to the eastern clade. The name that should apply to the western clade cannot be clarified until morphological and genetic data for “P. rupestris” is available from the vicinity of Bosaso, Somalia, and therefore we refer to it as Pristurus sp. 1. The phylogenetic tree of Pristurus supports the hypothesis that P. celerrimus is sister to all the other species in the analyses and that the Socotra Archipelago was independently colonized a minimum of two times. Badiane, Arnaud, Joan Garcia-Porta, Jan Červenka, Lukáš Kratochvíl, Roberto Sindaco, Michael D. Robinson, Hernan Morales, Tomas Mazuch, Thomas Price, Fèlix Amat, Mohammed Shobrak, Thomas M. Wilms, Marc Simó-Riudalbas, Faraham Ahmadzadeh, Theodore J. Papenfuss, Alexandre Cluchier, Julien Viglione & Salvador Carranza. 2014. 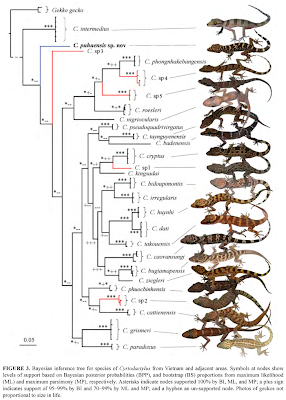 Phylogenetic Relationships of Semaphore Geckos (Squamata: Sphaerodactylidae: Pristurus) with an Assessment of the Taxonomy of Pristurus rupestris. Zootaxa. 3835(1): 33–58. Pascal Godefroit, Sofia M. Sinitsa, Danielle Dhouailly, Yuri L. Bolotsky, Alexander V. Sizov, Maria E. McNamara, Michael J. Benton and Paul Spagna. 2014. 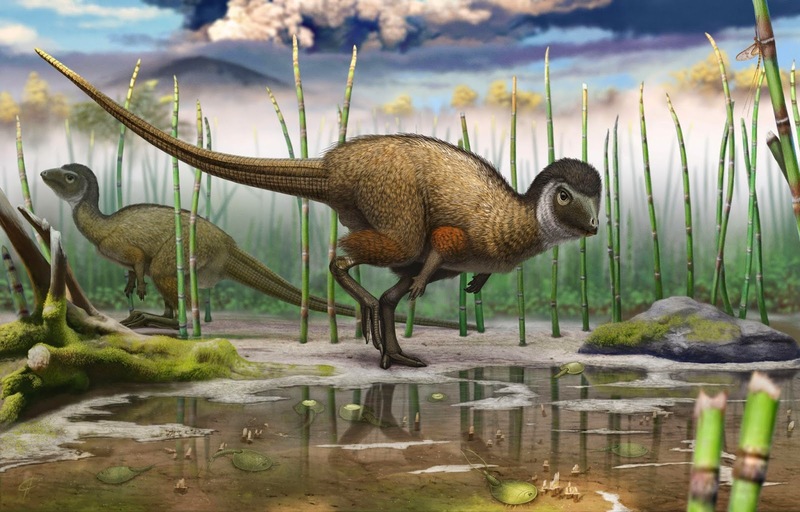 A Jurassic ornithischian Dinosaur from Siberia with both feathers and scales. Science. 345(6195): 451-455. Fig. 51. 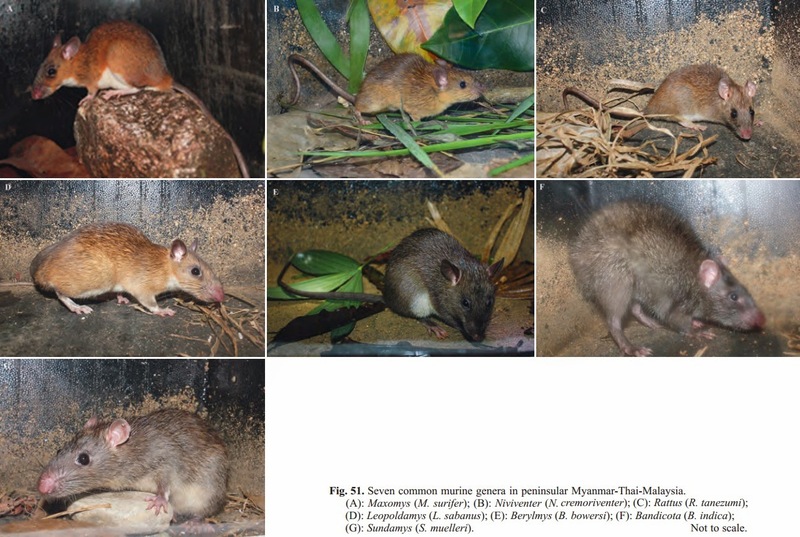 Seven common murine genera in peninsular Myanmar-Thai-Malaysia. 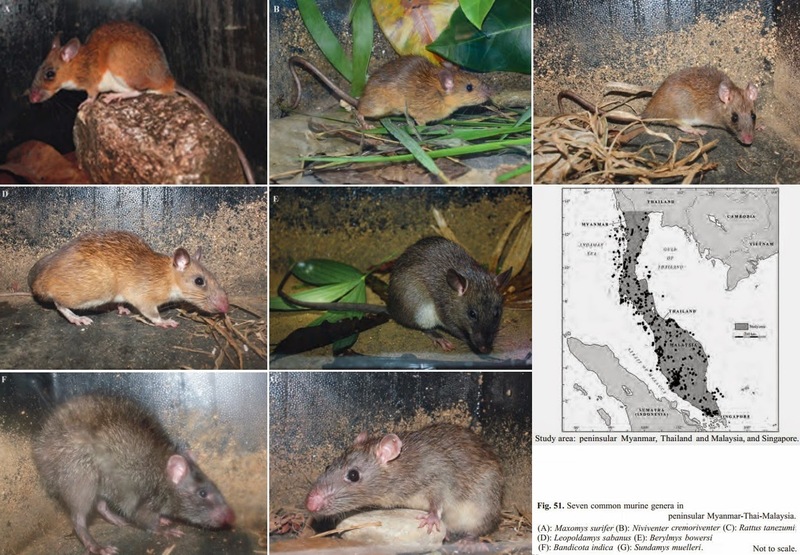 (A): Maxomys (M. surifer); (B): Niviventer (N. cremoriventer); (C): Rattus (R. tanezumi); (D): Leopoldamys (L. sabanus); (E): Berylmys (B. bowersi); (F): Bandicota (B. indica); (G): Sundamys (S. muelleri). 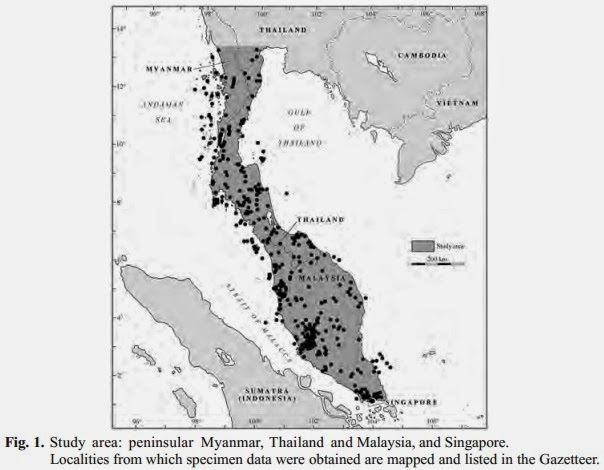 Based on field surveys undertaken between 2010 and 2013, museum studies in Thailand and the UK, and an extensive literature review, this paper provides information on the 28 species and 12 genera of murine rodents currently known from peninsular Myanmar, Thailand and Malaysia and Singapore. It incorporates a detailed summary of past research, 1851–2013, of the Murinae in the study area and includes descriptive characters of the external, cranial and dental morphology and measurements for each of the rodent species. It lists and maps the 93 murine taxa described from the peninsula, 84 of which are currently considered to be synonyms at species level. Each of the 389 different localities on the 28 distribution maps is numbered and linked to its source, either literature or museum specimen, and listed in the online gazetteer. The global conservation status of each species is obtained from the IUCN Red List. Remarks are made, where data are available, on the ecology, karyology, fossil history, sperm morphology, phylogeny, and taxonomic history and ambiguities. Recommendations are made for further research. A series of illustrated matrix keys is provided to assist with the identification of all the murine genera and species within the study area. Key words: Taxonomy, distribution, identification keys, karyology, ecology, conservation status. Fig. 1. Study area: peninsular Myanmar, Thailand and Malaysia, and Singapore. FIGURE 11. A. Zingiber brachystachys Triboun & K. Larsen; B. Z. callianthus Triboun & K. Larsen; C. Z. chantaranothaii Triboun & K. Larsen; D.-E. Z. cornubracteatum Triboun & K. Larsen; F. Z. isanense Triboun & K. Larsen; G. Z. parishii Hook.f. subsp. phuphanense Triboun & K. Larsen, H.-I. Z. pyroglossum Triboun & K. Larsen; J. 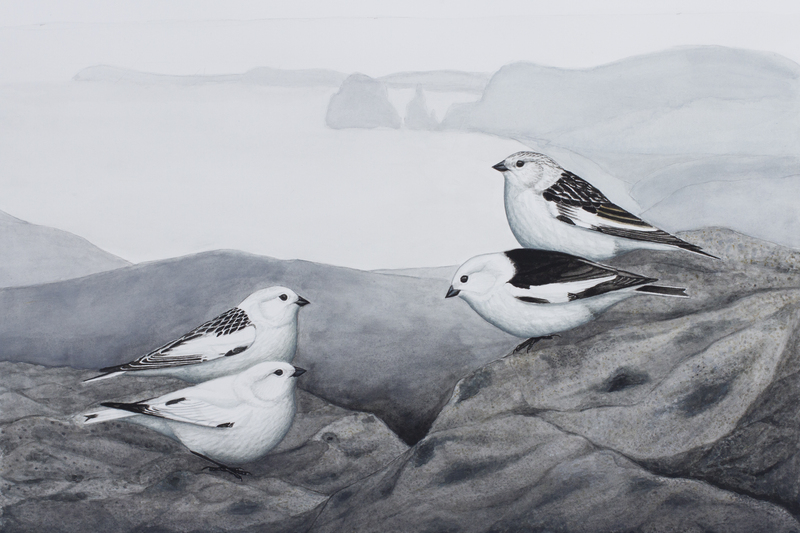 Z. sadakornii Triboun & K. Larsen; K. Z. tenuiscapus Triboun & K. Larsen; L. Z. vittacheilum Triboun & K. Larsen. 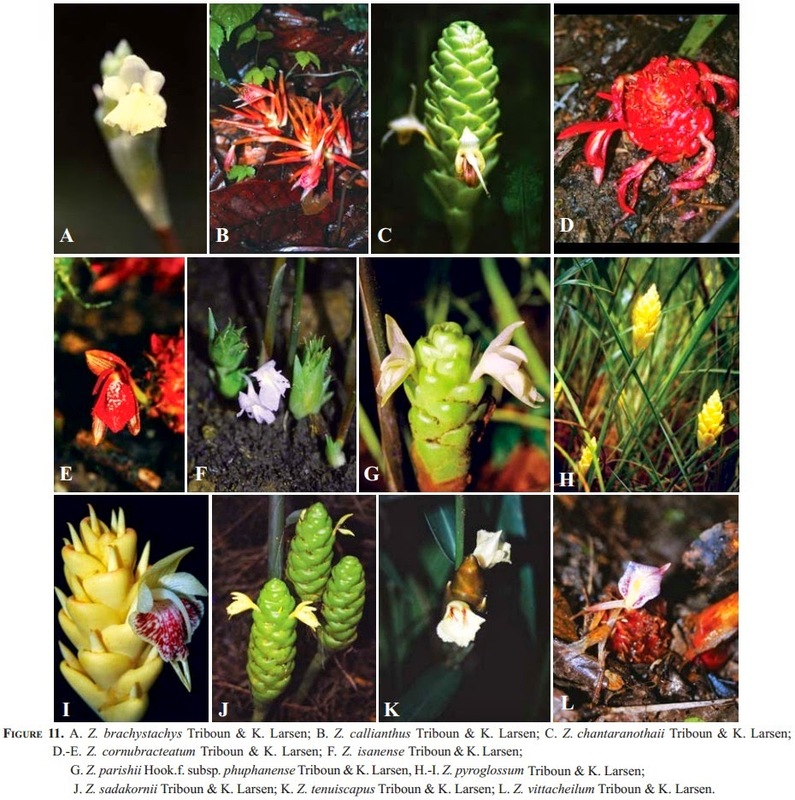 A key to the genus Zingiber in Thailand is presented and 10 new taxa are described and illustrated: Z. brachystachys Triboun & K. Larsen, Z. callianthus Triboun & K. Larsen, Z.chantaranothaii Triboun & K. Larsen, Z. cornubracteatum Triboun & K. Larsen, Z. isanense Triboun & K. Larsen, Z. parashii Hook.f. subsp. phuphanense Triboun & K. Larsen, Z. pyroglossum Triboun & K. Larsen, Z. sadakornii Triboun & K. Larsen, Z. tenuiscapus Triboun & K. Larsen and Z. vittacheilum Triboun & K. Larsen. PRAMOTE TRIBOUN, KAI LARSEN and PRANOM CHANTARANOTHAI. 2014. A Key to the Genus Zingiber (Zingiberaceae) in Thailand with Descriptions of 10 New Taxa. 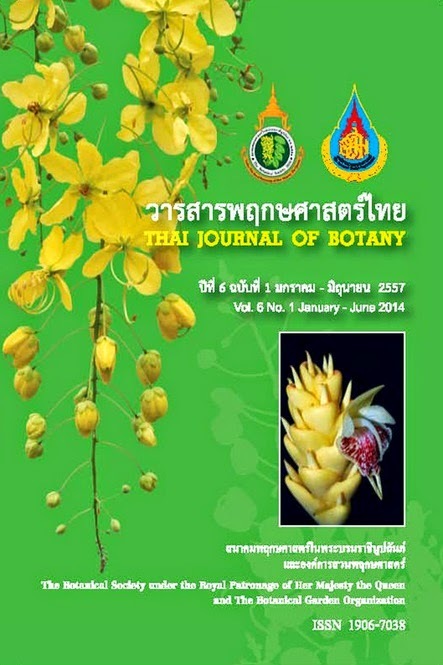 Thai Journal of Botany. 6(1): 53-77. FIGURE 1. Adults of Helictophanes and Cyphophanes. A. Helictophanes flava, n. sp. (holotype male). B. H. flava, n. sp. (paratype female). 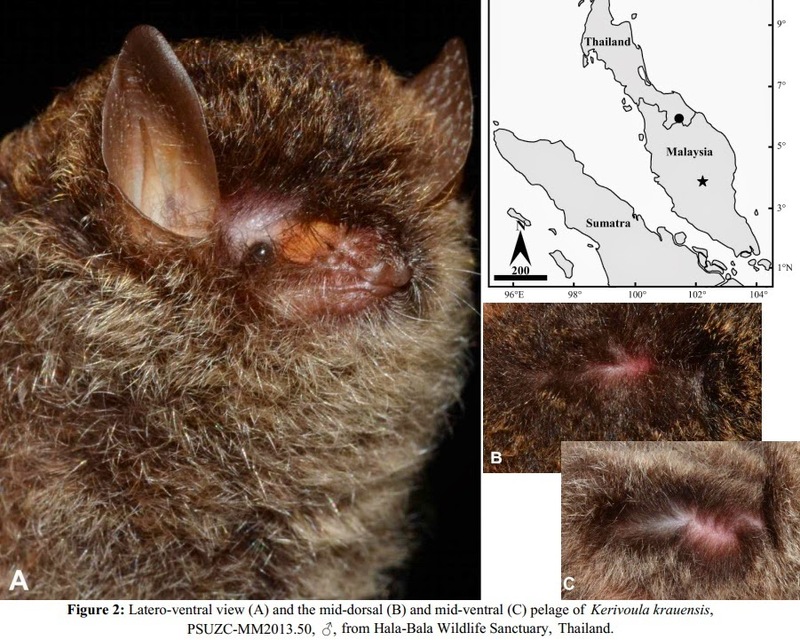 Two new species of the tribe Enarmoniini (Tortricidae) are described from the Chanthaburi and Trat provinces of eastern Thailand: Helictophanes flava Muadsub and Pinkaew, n. sp., and Cyphophanes khitchakutensis Muadsub and Pinkaew, n. sp. Illustrations of adults and genitalia are provided. Muadsub, Sawitree & Nantasak Pinkaew. 2014. 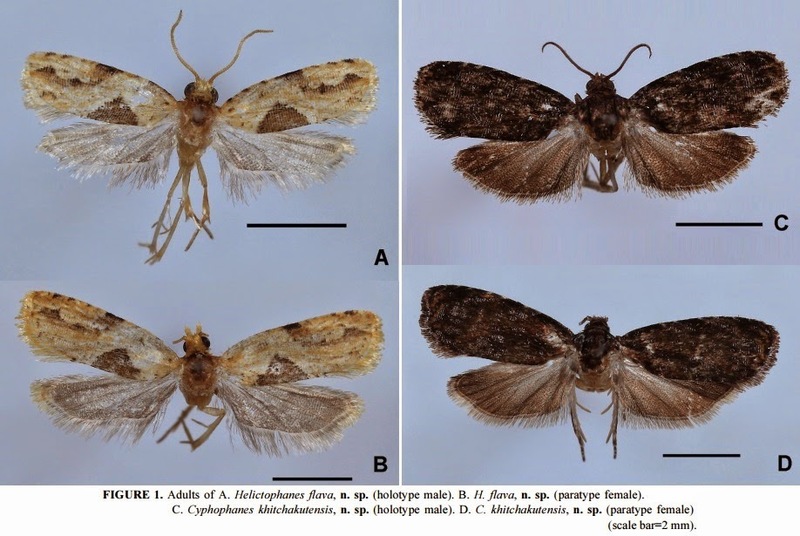 Two New Species of Enarmoniini (Lepidoptera: Tortricidae) from eastern Thailand. Zootaxa. 3841(1): 127–134. Fig. 1. Habitat of Voeltzkowia rubrocaudata: corn plantation (in foreground) near the village of Andranomaitso, Commune rurale de Sakaraha. A. dorso-lateral overview; B. dorsal view; C. head close up; D. individual burrowing in the substrate. Photos by Gonçalo M. Rosa. 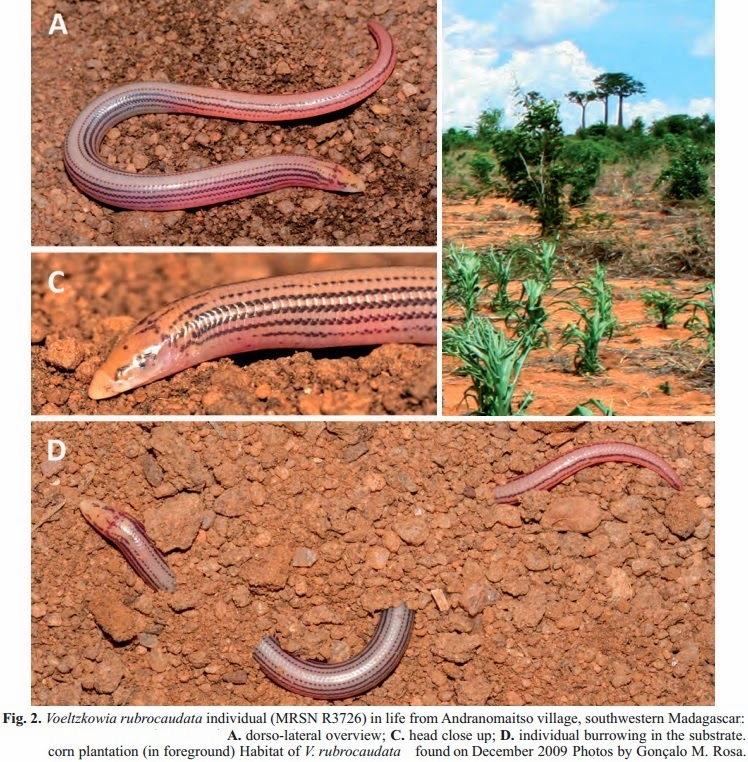 Voeltzkowia is a monophyletic genus of burrowing skinks endemic to Madagascar. The fossorial habits of these species make them hard to see and study, and witness their life history traits. 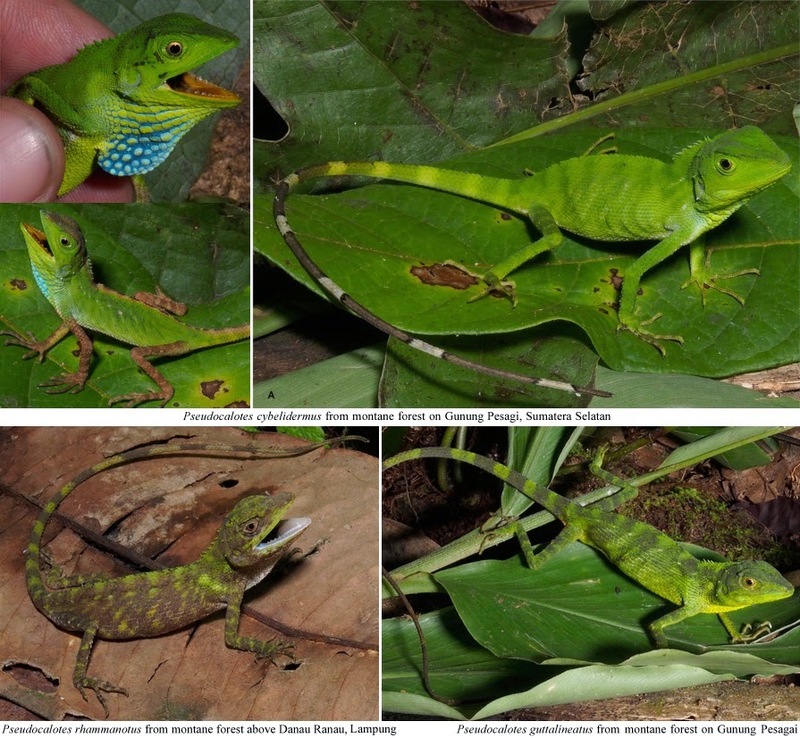 During two herpetological surveys in southwestern Madagascar (in 2009 and 2011) we found several Voeltzkowia rubrocaudata individuals in a corn plantation, a habitat that differs from the forested habitat reported in the literature. Life colouration for this shy scincid is described for the first time. Key words. Southwestern Madagascar, corn plantation, Squamata, Scincidae. Etymology: The specific epithet is derived from the Malagasy words “mavo” (yellow) and “tenda” (throat) and refers to the yellow throat of the holotype. It is to be treated as a noun in apposition for the purposes of nomenclature. F. Glaw, Z.T. Nagy, J. Koehler, M. Franzen and M. Vences. 2009. 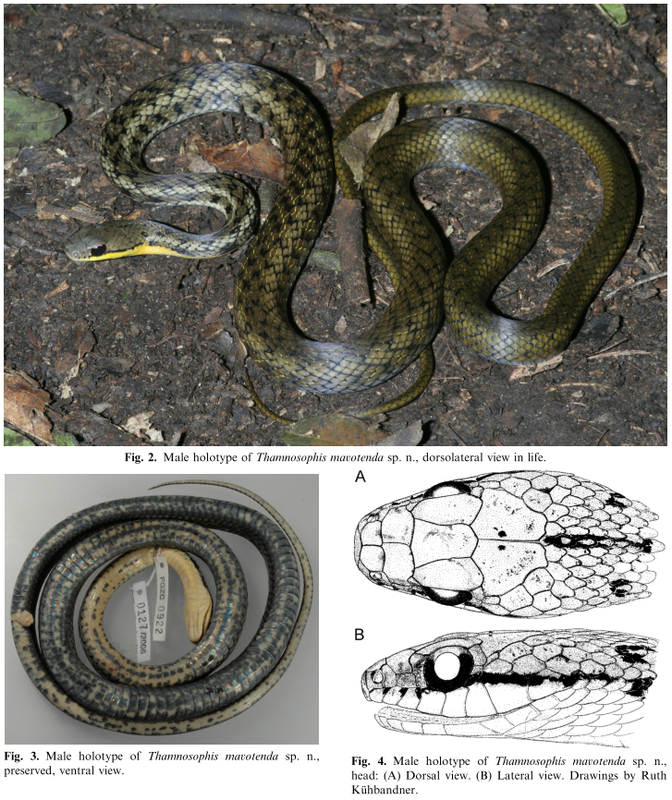 Phylogenetic Relationships of A New Species of pseudoxyrhophiine Snake (Reptilia: Lamprophiidae: Thamnosophis) Suggest A Biogeographical Link Between western and northern Madagascar. 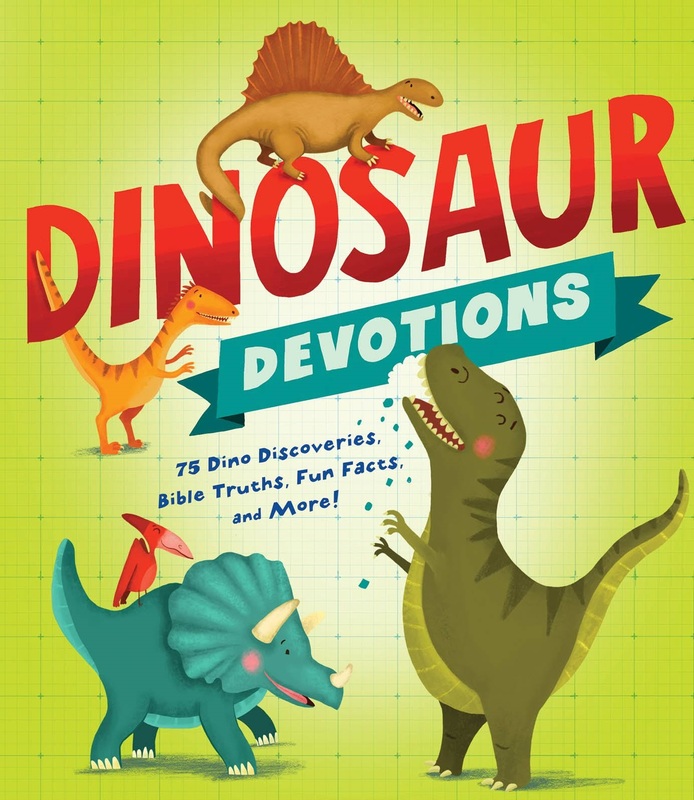 Organisms, Diversity & Evolution 9:13-22. The oldest reported fossil record of Delphinidae is from the late Miocene (11 Ma) of California. Reliable Miocene fossil delphinids, however, are few. “Eodelphis” kabatensis from the upper Miocene Mashike Formation (8.5-13.0 Ma), Hokkaido, northern Japan, is the oldest described Miocene delphinid including a skull. Therefore, this species is a significant clue to understanding the early evolutionary history of Delphinidae. The original taxonomic assignment of this species within the genus Stenella is questionable; thus, we propose a new combination for the species, “Eodelphis” kabatensis Horikawa, 1977. Eodelphis is a basal delphinid, and comprehensive morphological cladistic analysis, including molecular topological constraints, supported this taxonomic revision. Paleobiogeographic analyses based on the present morphological cladistic analysis and analysis under the molecular constraints suggest that the origin and early diversification of Delphinidae occurred in the middle Miocene Pacific Ocean or elsewhere, respectively. 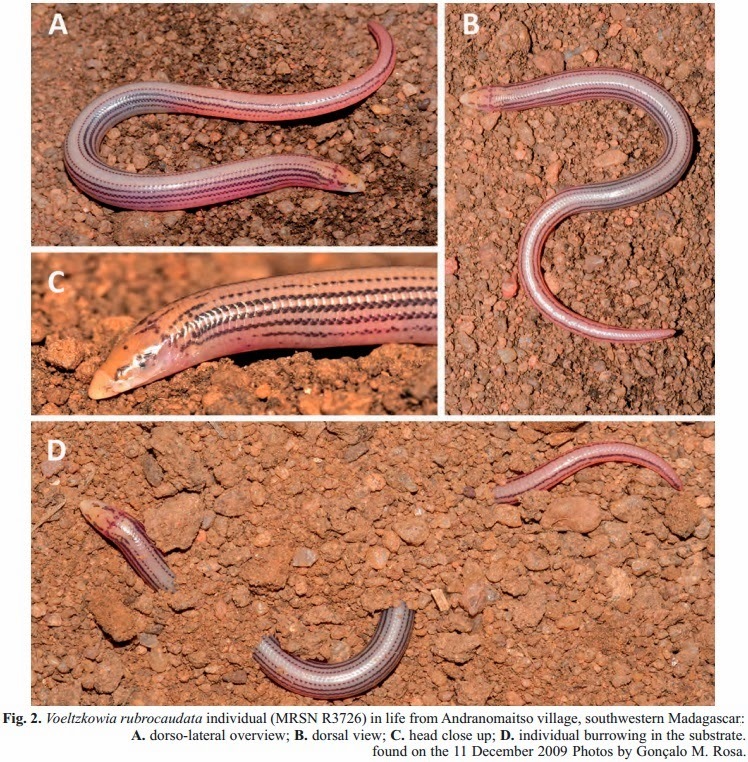 Type and Only Known Species: “Eodelphis” kabatensis (new combination). Diagnosis: As for the type species. Etymology: From the Ancient Greek ‘Eo,’ for dawn referring to the earliest delphinid; and from Latin ‘delphis,’ for dolphin. Delphinidae, gen. et sp. indet. Horikawa and Fujita, 1972:177, pl. 1. Stenella kabatensis: Horikawa, 1977:98, figs. 2–8, pls. 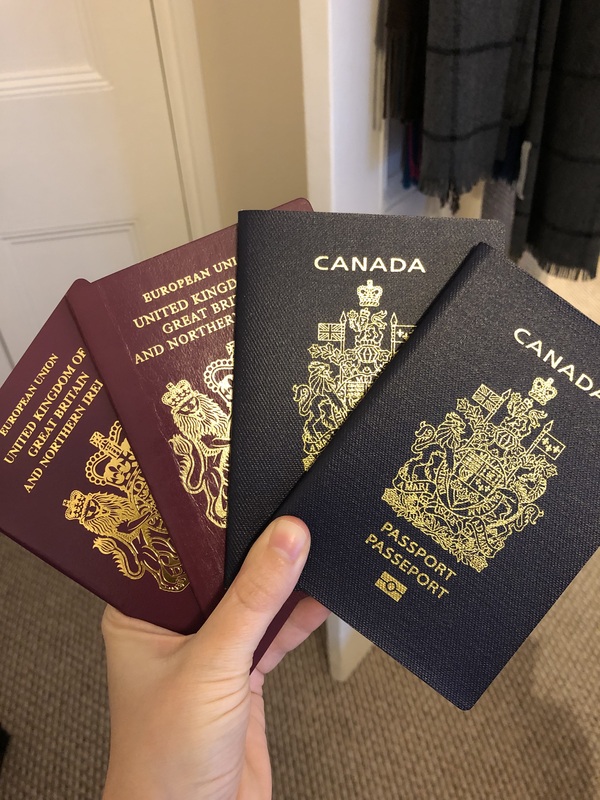 1, 2. Delphinidae, gen. indet. Ichishima, 2005:11. We redescribed the late Miocene delphinid, Stenella kabatensis (8.5–13.0 Ma), from Hokkaido, northern Japan, as a new genus “Eodelphis”. Both a comprehensive morphological cladistic analysis and this analysis under the constraint tree of molecular phylogenetic analyses support a new combination of the species; i.e., Eodelphis is significantly more archaic than the Stenella complex. 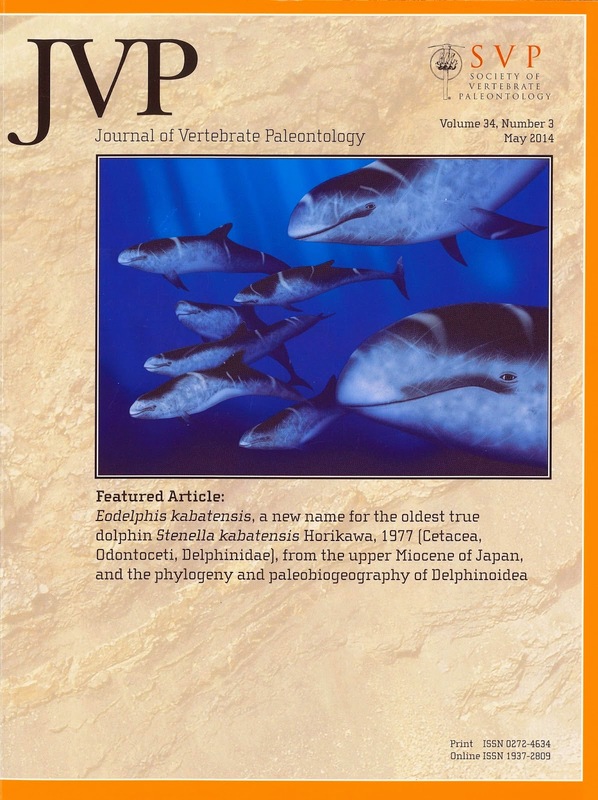 Those analyses also indicate that the two extinct species Stenella rayi and Tursiops osennae are not included in the Stenella complex. “Eodelphis” is significant for understanding the origin, early evolution, and paleobiogeography of Delphinidae, as well as calibration of the molecular divergence estimates: “Eodelphis” kabatensis is the oldest and only valid Miocene delphinid species yet described. However, paleobiogeographic analyses based on the present phylogenetic analyses suggest different biogeographic scenarios: origin and early diversification in the middle Miocene Pacific Ocean or outside the Pacific Ocean. To resolve the origin of Delphinidae, we need to include more fossil delphinids and kentriodontids in phylogenetic analyses. 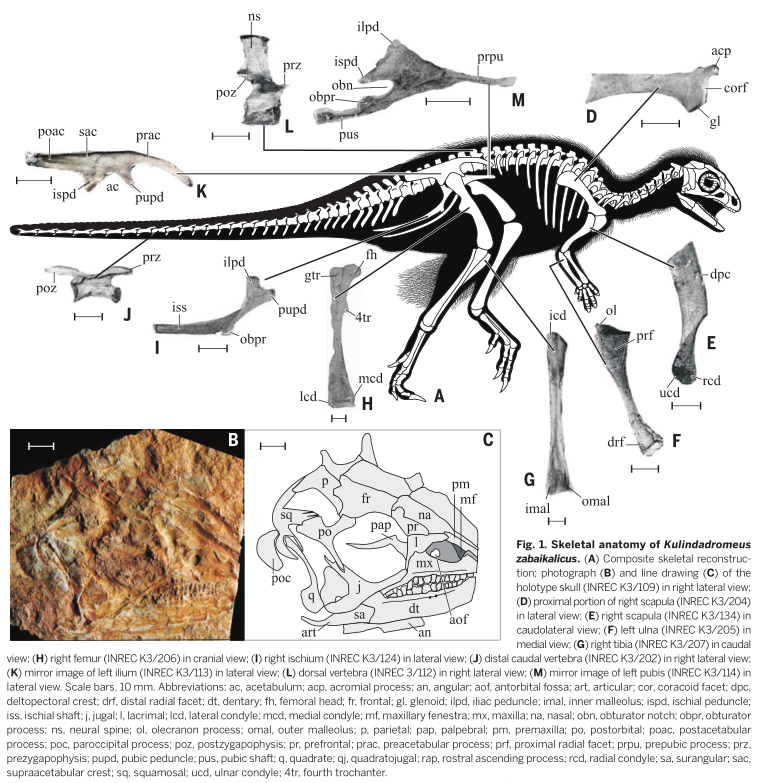 Therefore, here we propose Eodelphinus gen. nov. for the late Miocene delphinid Eodelphis kabatensis Horikawa, 1977 to replace Eodelphis Murakami et al.,2014, which is a junior homonym of Eodelphis Matthew, 1916. 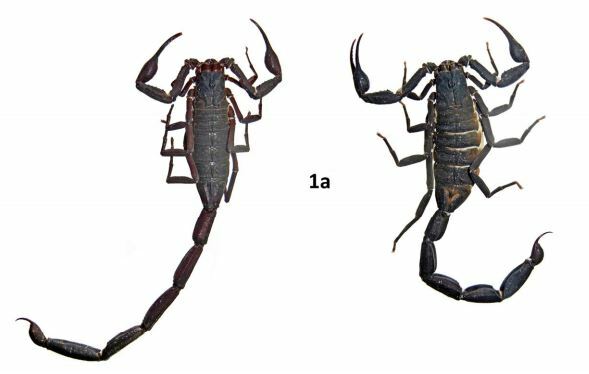 Anew combination for the species is Eodelphinus kabatensis. 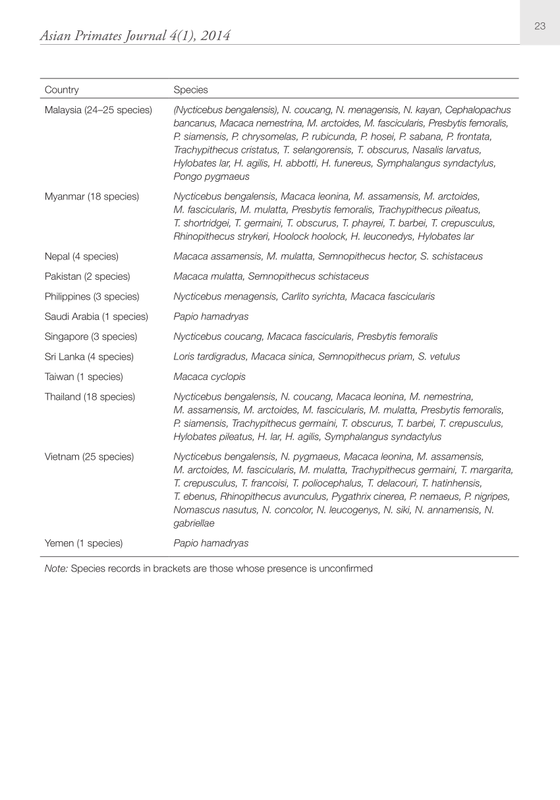 The diagnosis and content of the new genus follows Murakami et al.(2014). 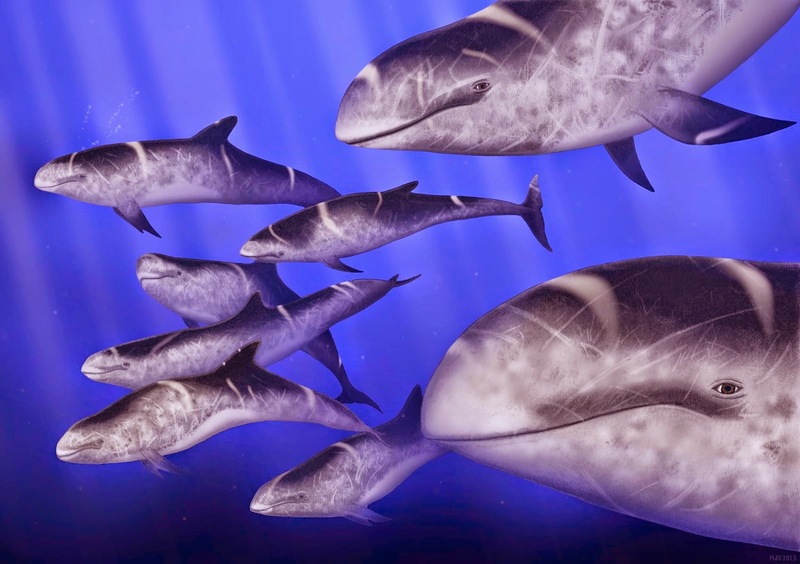 Eodelphinus derives its name from the Ancient Greek ‘Eo,’ for dawn referring to the earliest delphinid; and delphinus,the Latin name for dolphin. Unfortunately as it turns out - Eodelphis is a preoccupied name for Cretaceous marsupial. So, it will require an additional paper proposing yet another replacement name. 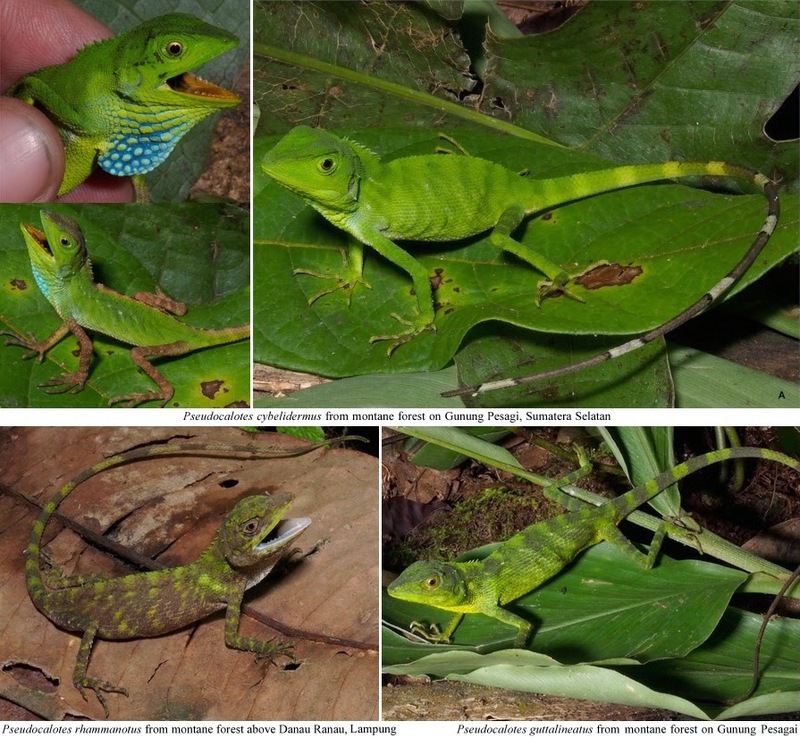 We describe a new species of the gekkonid genus Cyrtodactylus on the basis of two specimens collected from limestone forests of Luang Prabang Province, northern Laos. Morphologically, the new species is distinguishable from its congeners by a combination of the following diagnostic characters: maximum SVL 86.1 mm; supralabials 9 or 10; infralabials 7–9; dorsal tubercles in 15 or 16 rows at midbody; ventral scale rows 34–36 at midbody; precloacal groove absent; femoral scales not distinctly enlarged; precloacal pores absent in females (unknown in males); subdigital lamellae under the fourth finger 18 or 19, under the fourth toe 18–20; subcaudals not transversally enlarged; dorsal bands white, 4 or 5 between limb insertions plus another one between hind limbs; tail banded. 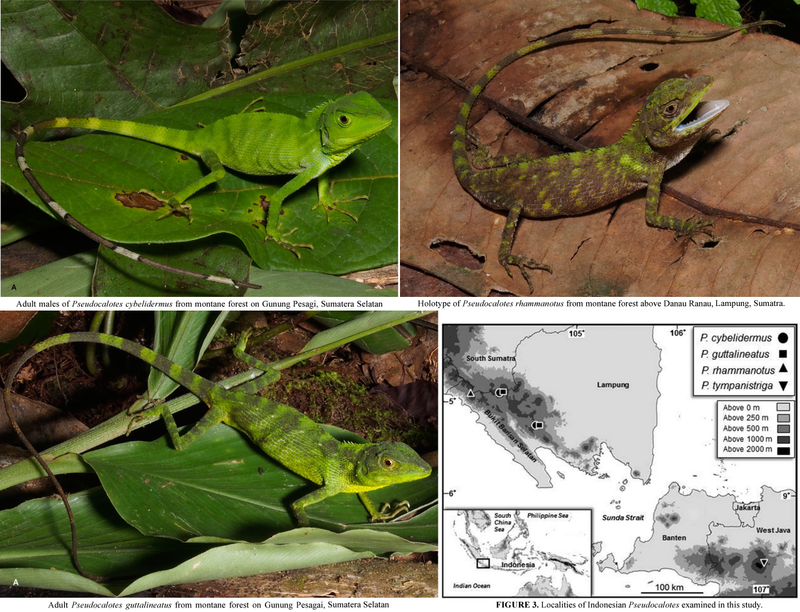 Based on molecular analyses, the new species is clustered in the same clade with C. wayakonei and two other species from Luang Prabang and Houaphan provinces. Schneider, Nicole, Truong Q. Nguyen, Minh D. Le, Liphone Nophaseud, Michael Bonkowski & Thomas Ziegler. 2014. 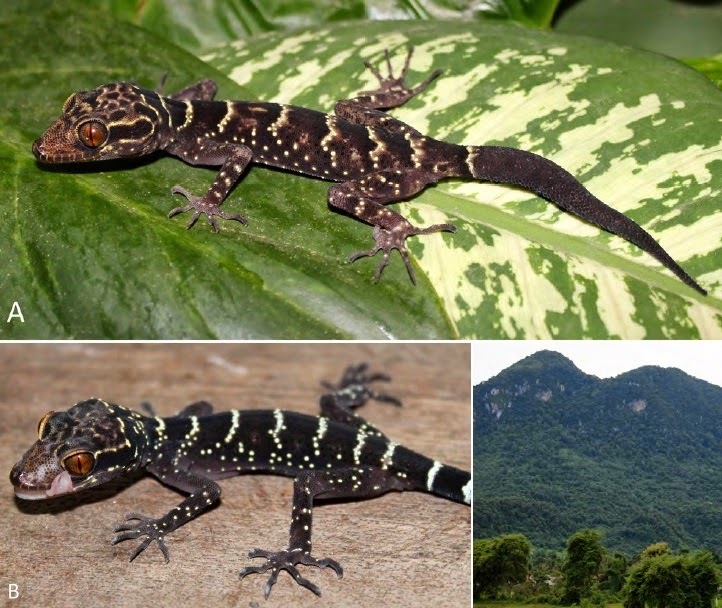 A New Species of Cyrtodactylus (Squamata: Gekkonidae) from the Karst Forest of northern Laos. Zootaxa. 3835(1): 80–96. 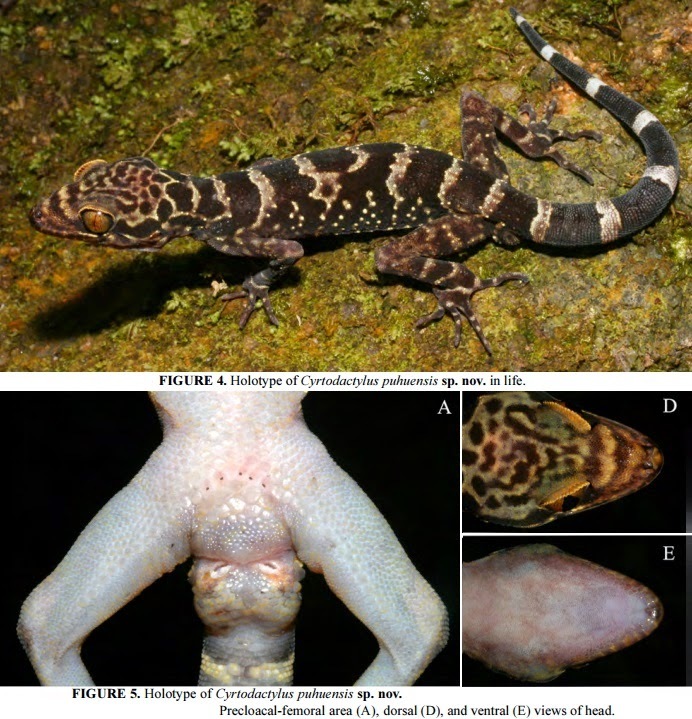 Species of bent-toed gecko (Cyrtodactylus) in Vietnam have been described at a rate of nearly four species per year since 2007 mostly based on morphological data. A tool that guides species delimitation will accelerate the rate of documentation, and at a time when the recognition of species greatly benefits conservation. We use DNA barcoding using COI (550 bp) to re-examine the levels of genetic divergence and taxonomic status of 21 described species of Vietnamese bent-toed geckos. Tree-based analyses resolve all sampled species and identify potential undescribed taxa. Kimura 2-parameter genetic distances between the described species average 21.0±4.2% and range from 4.3% to 28.7%. 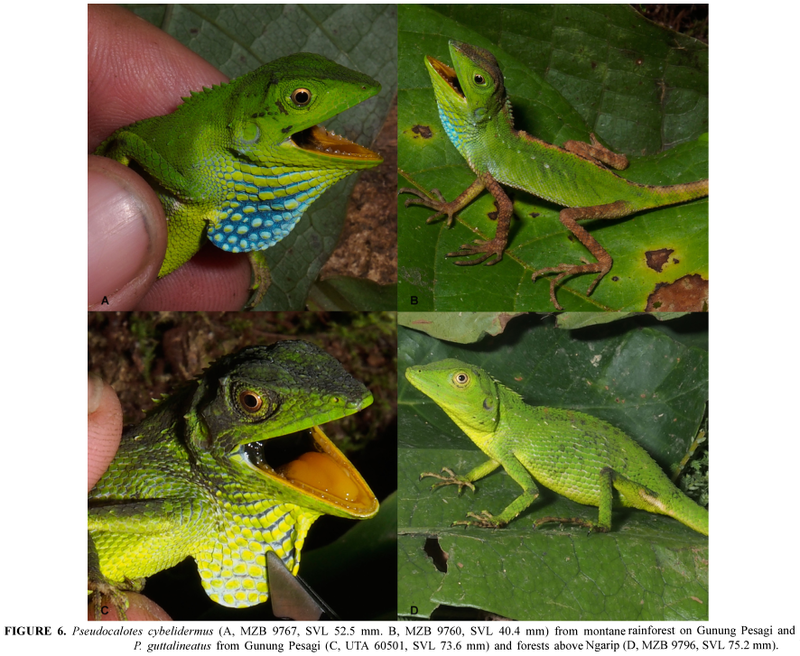 Further, our analyses discover two potentially new species from Vietnam, two from Laos and one from China. 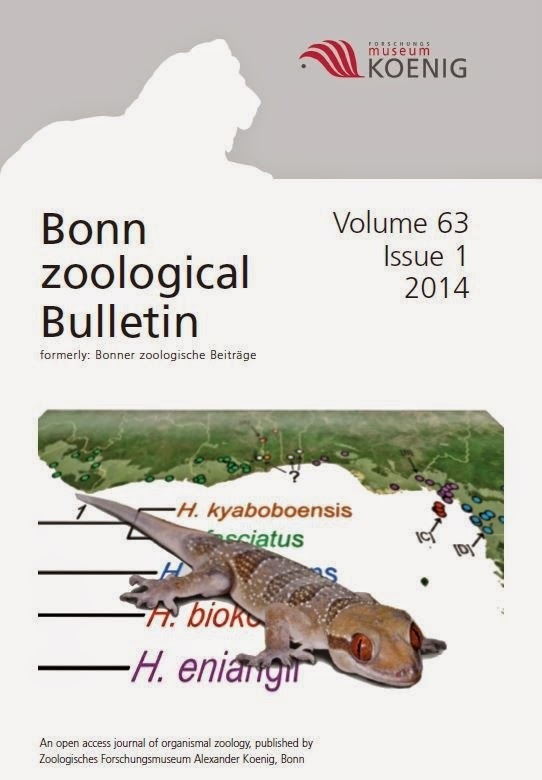 Herein we describe the new species Cyrtodactylus puhuensis sp. nov. from Vietnam on the basis of both genetics and morphology. Genetically, it differs from the remaining species by an average K2P distance of 24.0±1.8%. Morphologically, the new species is diagnosed by its medium-size (snout-vent length 79.24 mm and tail length 82.59 mm, for the single known individual), in having a series of moderately enlarged transverse subcaudals and a series of moderately enlarged femoral scales that extend from precloacal scales, in possessing femoral scales without pores, with males having five precloacal pores, and in exhibiting 8 supralabials, 10 infralabials, 23 narrow subdigital lamellae on its fourth toe, and 36 transverse ventrals. FIGURE 3. Bayesian inference tree for species of Cyrtodactylus from Vietnam and adjacent areas. Etymology. The specific epithet puhuensis refers to the type locality, Pù Hu Nature Reserve, where the new species was discovered. Distribution and Habitat. Cyrtodactylus puhuensis sp. nov. is known only from the Pù Hu Nature Reserve, in northwestern Thanh Hóa Province, northern Vietnam (Fig. 2). The single known specimen of this new gecko was found at night on a large tree (diameter about 1.5 m), at about 2.5 m above the forest floor. 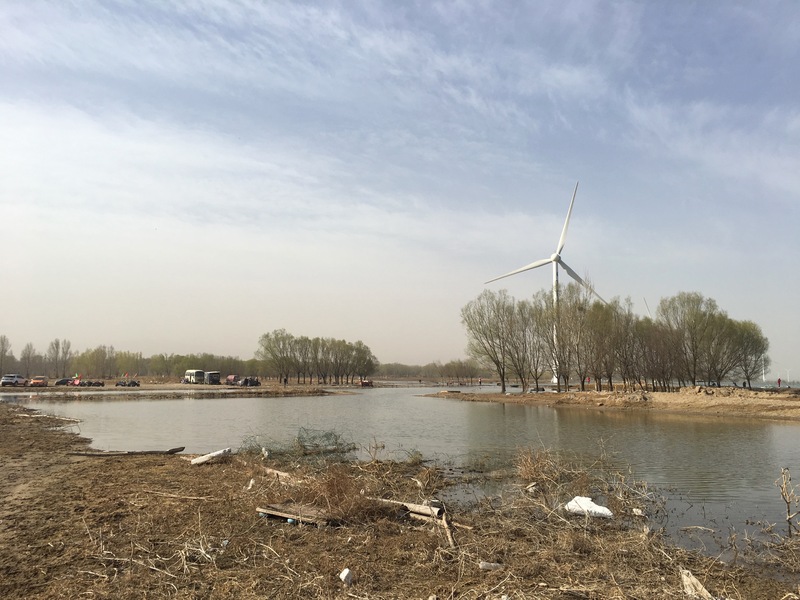 The habitat was evergreen forest intermixed with bamboo. Limestone was not observed in the area and the recorded elevation was 638 m.